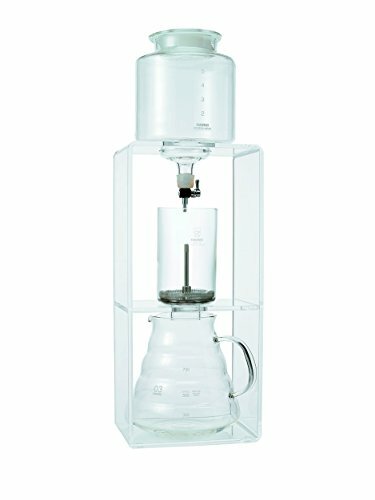 For a smooth, mellow brew, this beautifully designed coffeemaker uses the classic cold-drip method to produce full-flavored coffee concentrate ideal for making iced beverages and for use in recipes. Use right away or store the concentrate in the fridge, so when you're ready for a steaming cup of coffee, just mix with hot water. The classic brewing system brings out coffee's flavor and aroma by slowly dripping cold water through finely ground beans. Brewing your coffee with cold water preserves delicate flavor and eliminates bitter oils and acids that would be extracted at higher temperatures. A metal valve controls the drip to ensure perfect drop-by-drop percolation. Set includes a stainless steel filter. Dishwasher safe. Makes up to 26 oz.. of coffee concentrate, enough for approximately 2 to 6 cups of coffee.